When you think of teenage problems, what typically comes to mind? Passing a big exam, who to ask to prom, college applications, getting a driver's license --- ya know, things of the mundane sort. But Lena Duchannes isn't your average teenager and driving is the least of her problems. What the good people of Gatlin don't know is that Lena's a castor, a witch who will be claimed for either the light or the dark upon her sixteenth birthay. This claiming has the power to irrevocably change her life and the lives of all humans, because unbeknownst to her, she will become the strongest castor of them all. Ethan had no idea what was in store for him when he befriended the mysterious outcast, Lena. Now he's caught up in a mystical battle between good and evil as he struggles to protect the girl he loves. Fates will forever be changed, secrets uncovered and choices made as a dark power takes hold over Lena. Will Ethan and Lena live long enough to discover the secrets behind their unusual connection or will they die trying? Yo, I really hate to do this to ya'll but I'm totally going to compare the book to the movie here. I know! I know! I can't help it. I like to think of myself as an equal entertainment opportunist who tries to give both mediums the benefit of the doubt because, well... I like books and movies. So yeah. It's a sick compulsion I have so you're all just gonna have to get used to it, mmk? It's just easier for me to do a cross-comparison on the two, particularly with regard to Beautiful Creatures, so that's how it's gonna go down. Basically, to sum up my movie-going experience, however charming and delightful it was, it was all sorts of hell'a confusing. Don't get me wrong, I liked the movie but I felt like there was a lot plot-wise that got lost in translation. I needed my friend (who read the book) to clarify a few things. It had sooo much potential so I went into the book with the hope that it would fill in the gaps and amp things up a notch or two. As it turns out, I was right, at least on one of those counts. The book was certainly more succinct and clear, however, it lacked much of the character of its on-screen counterpart. The movie oozed Southern charm and I really felt that small-town, narrow-minded vibe of the Southern setting. With the book, it was there but I felt like I was told it more than shown it. Where the book does excel though is in showing the connection between Ethan and Lena, physically and mentally. They have a pretty unique means of communication which wasn't touched on at all in the movie. Another thing I dug about the book was the plot (and not just because it made sense here). The idea of casters and mortals and witchery taking place in the underbelly of this sleepy, forgotten town is really amazing. I loved all of the different forms of magic employed by the magical folk, much of which was skimmed over in the movie. Also, many of the key characters from the were ommitted or condensed in the film (such as Amma) so it was nice to finally get to see all of those relationships and how they affected Ethan and Lena. Side Note: Can I just say how much I adored Amma in the book? I LOVED the surrogate motherly sort of relationship that she had with Ethan and also how much she embodies old Southern superstition to the max. Oh! 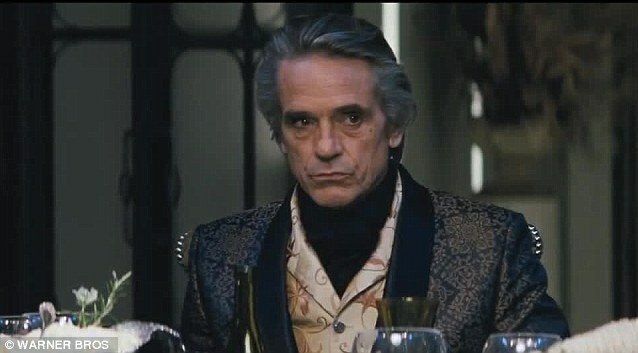 And the casting of Jeremy Irons to play the reclusive Macon was spot-on! He IS Macon to a tee. I mean, look at him! Sheer perfection. Okay, back on track. As far as the action goes, it culminates much more slowly in the book whereas in the movie its non-stop. I guess I wouldn't normally have a problem with this because I liked getting to know the characters and seeing how ostracized Lena was, but when contrasted with the super-mega-insta-love, it just draaaaaaagged. The book is primarily told from Ethan's POV, which I really liked, but then there's this really random scene from Lena's POV that just sorta comes out of nowhere. I get what the authors were trying to do here and I'm not sure if there was a better way to show that particular scene, but regardless, it didn't quite fit. I guess what really threw me off about the book was that the main characters, namely Ethan, were so much more charismatic on-screen. We get a lot more insight into Ethan's thoughts in the book but he was still missing that boyish allure that his screen doppelgänger had. It too me much longer to warm up to him on the page as opposed to on the screen. Lena, however, was less tempramental and felt more like a real teenager for me in the book. I identified with her character more after seeing just how much torment she went through. There was a bit of a Stephen King Carrie-esque moment that had me squirming and sympathising for her. I thought Amma, Marion, Ridley and Seraphine were superior here but Lena, Ethan and Macon were better in the film. Overall, I'd say there were definitely some hits and misses for me with both the book and movie and if you mashed the two together, it would've been a total winner. Either way, I enjoyed them enough to see/read the sequels. Beautiful Creatures didn't completely live up to its potential for me as either a book or a movie. There were things that I liked better in each of them and if you put them together, you'd have the ultimate story. The book is quite comprehensive and pulls you into the typical high school experience, though it lacks the charm and charism of its Hollywood counterpart. After both experiences, I suggest reading it and watching it because this is one of those cases where one is not complete without the other. HA! Good plan, Kay! I look forward to our rousing discussion on both. Honestly, they weren't terrible and each one definitely had its perks. I guess I was just underwhelmed overall and thought there could've been so much more to it. But I've read/seen worse, so there's that too. It's such a shame but I feel like one wasn't complete without the other. If I had to choose, I'd say read the book because atleast you can follow it and it all makes sense. It's just a shame that it was lacking all of the character of the movie. Ah, oh well. Great post. You know, I think it's hard to bring novels onto the big screen. So much can get lost in translation, things get left out, switched up, etc. 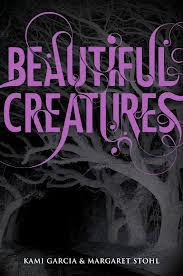 I haven't read or seen Beautiful Creatures, but I have seen lots of hype. I like Jeremy Irons too. It really is and I try to go into them knowing that there are going to be differences. I guess I'm really looking for them to keep the essence of the original source material which so often gets lost in the book to screen translation. Beautiful Creatures was great in theory but lacking in execution (both the book and the film). I cannot watch the movie. :( I made the mistake of reading the book, falling in love with it, and I cannot bring myself to watch the movie. If you loved the book then I would recommend you NOT watch the movie. You'll be really disappointed. And this is exactly why I have a tendency to do the movie first (when I can). I usually end up with less disappointment. I felt pretty "meh" about this book overall--and I don't blame you for comparing it to the movie, it's hard not to do that if you've recently seen it! I agree that the characters could have been a lot more charismatic. Like...a LOT more, hah. My thoughts exactly, Wendy! The plot was decent and original enough and the setting was perfection, I dunno. The characters seemed sort of "stock" to me though. And whereas the movie was almost incomprehensible plot-wise, it had soooo much more charisma and charm. Like I said, if you melded the two together, you'd have the quintessential perfect story! I've been debating about whether to read this series before I see the movie. I'm feeling rather ambivalent about it. But perhaps if I see the movie and like it enough, that will make me want to pick up the book. I did that with the first harry potter. I saw the movie and fell in love so read the books. I hate when a movie leaves out so many details that the plot is confusing, though. I'm still up in the air about it all, so I'm avoiding both right now. But great review and comparison. I think I got a good picture of the pros and cons of each. Glad I could help, Lauren! I almost feel like the book is a safer bet to start with if only for the fact that you get a more comphrensive plotline. But then you do run the risk (if you enjoy it) of hating the movie because it's SO vastly different. If you do the movie first, I'd recommend at least getting a general gist of the plotline so that you have some idea of what's going on. And I'm interested to hear back on your thoughts should you read and/or watch it!